Price: AUD$165 (Hardback); overseas postage varies. And there’s nothing in the book that disappoints that expectation. This book is only for the most serious student of viticulture and wine, who has a ready grasp of science. 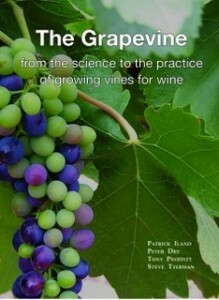 From the grapevine, to its structure, function, growth, and berry production, the reader is taken through the current science and offered insight into practical aspects of the science. The mechanism of scientific literature review, summarising research studies, and outlining them in the case of ongoing studies, is the main channel for content in this book. So while, for example, studies on shiraz, grown in a particular location, suggested a positive relationship between berry colour and wine score, the authors exercise caution at the idea of extrapolating these data too far beyond the specific location. An advantage of the format is that detailed insight into particular aspects of each subject can be presented, and these are then rounded out with additional references, and explanatory sections. On many pages a small portion of text is centred in the column and in a different fount, to highlight the key point being expounded in main body of the text, for example in the section on wine style and quality the highlighted text is ‘we define grape quality as the suitability of a batch of grapes to produce a wine of high quality of a targeted style. Suitability is the key word’. Thus chardonnay ripened to make Champagne wouldn’t make an exciting still wine. Indeed, the practical application of the science is a theme running at the heart of the book. This is not high-brow content for the sake of it. Coloured symbols draw the eye to sections where practical considerations are offered, or questions posed to the reader, for example, on the efficient use of water, or are small berries an advantage for wine quality? Further chapters cover fruit growth, water relations, climate and training the vine for particular locations, as well as a look at the vine in relation to its environment, touching on terroir, organics and biodynamics. Temperature and insolation are key themes of climate at the scale of macro, meso, and microclimate. Where a study had previously suggested a positive relationship between colour and wine score, other studies show the regional temperatures best suited to colour compound synthesis are found in cool to warm regions, rather than cold, hot and very hot regions. Thus the reader is able to build a complex picture of the factors affecting grapevine growth and overlay on it the styles of wine to be made in order to hone possible vineyard locations. Each chapter is littered with pictures, diagrams, graphs and charts, and extensive bibliographies so readers can further pursue particular points that pique their passion. Additionally, chapter summaries then draw the reader back to the main points, providing a succinct presentation. One gets a feel for how microscopically complex a thing it is growing grapes for wine. Finding a decent soil is only the beginning, but working with the climate to best express grape flavours and aromas is a whole another story. Do you want more monoterpenes (floral, citrus), methoxypyrazines (asparagus, green pepper) or norisoprenoids (honey-like, stewed apple) in your sauvignon blanc, for example? And according to the answer, where should you plant, and how should you manage your canopy? This book looks at those issues through the medium of longstanding and the latest science.